When sending emails to potential clients, you need to take care of every single detail. This email represents who you are and makes a first impression for you. First impressions are crucial. Your goal as a freelancer is to show you’re professional, trustworthy and competent. Therefore, you have to ensure you fashion a flawless email with a positive effect on the recipient. Email signatures are one of the most important features of a professional email. Why? It’s the last thing the recipient reads and it can easily make or break any deal. That’s why your task is to create the perfect email signature that your clients are going to love. Take a look at the 7 tips you need to know if you want to master the game of email signatures for freelancers. In the business world, it’s all about keeping things simple but to the point. The same goes for your email signature. You need to write it so as to make it informative enough but not carry any redundant or irrelevant information. These three points are a must. In addition, this information is the most important, so you need to make it stand out from the rest. Finally, keep in mind that you should never include your email in your email signature. It’s completely unnecessary and unprofessional to do it. If you have a website or you’re freelancing for a company, you can use your email signature to link your clients to your website. Include the name of the website and make it a clickable link. This way you’re showing your clients you’re not just a random person reaching out to them, but you’re actually a part of something bigger. 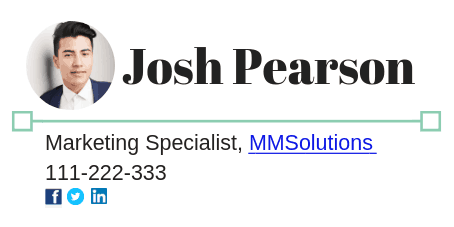 Your clients will find you much more reliable if your email signature shows more about your professional career. 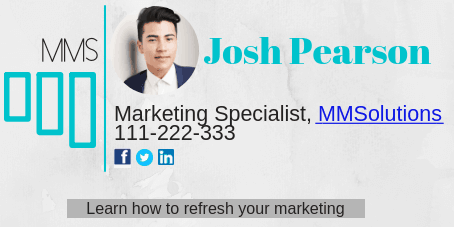 If you’re active on social media and you want your clients to check it out, you can add social media icons to your email signature. This move would deepen your professional image, help your client understand you better and learn more about you. In addition, it will drive traffic to your social media, which is great. 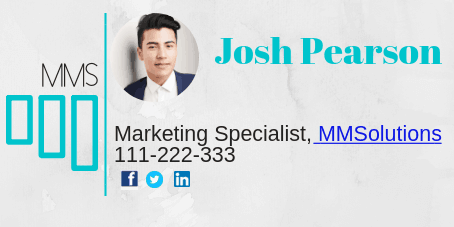 Therefore, add small social media icons to your email signature and you’ll be sending a clear message to the client: if you want to know more about me, check out my social media! People like to see the face behind the name. One of the best ways to create permanent bonds and long-term relationships with clients is to try establishing a more personal form of communication. We’re not saying you should address your clients the way you talk to your friends. On the contrary, you need to keep things professional. However, small details such as your picture could make all the difference for some clients. “Adding a picture to your email signature is always a great idea. It changes the tone of the message, making it more personal and consequentially, more acceptable for clients” says the CEO at PickWriters. As we’ve already mentioned, you can only make one first impression. That’s why it’s important to seize the moment and make the best out of the one shot that you’ve got. 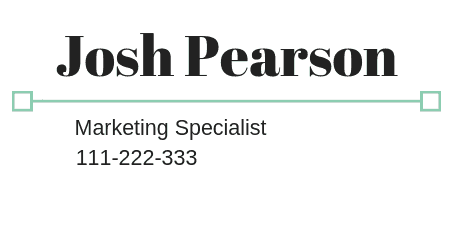 In order to make your email signature even more memorable and effective, you can add your business logo to the whole story. Make sure to incorporate your logo into the email signature and you’ll come across as a trustworthy professional who knows what he’s doing. Consistency is a great thing when it comes to brand image, marketing and showcasing your professionalism. If you want to walk the extra mile, you should always think big. That means that your entire business communication needs to be conveyed in the same, consistent manner. In order to make a connection between your social media accounts, website, portfolio, and emails you need to make all of these visually universal. You need to choose certain colors and fonts which represent you as a freelancer and a professional. Then, you need to use the same colors and fonts on all your platforms. The same goes with email signatures for freelancers. Make your signature is in accordance with the rest of your platforms and show how precise and thorough you are in every aspect of doing business. Once you’ve got all the pieces of the puzzle put together, it’s time for the final touch. You can use your email signature to invite the client to take certain actions. 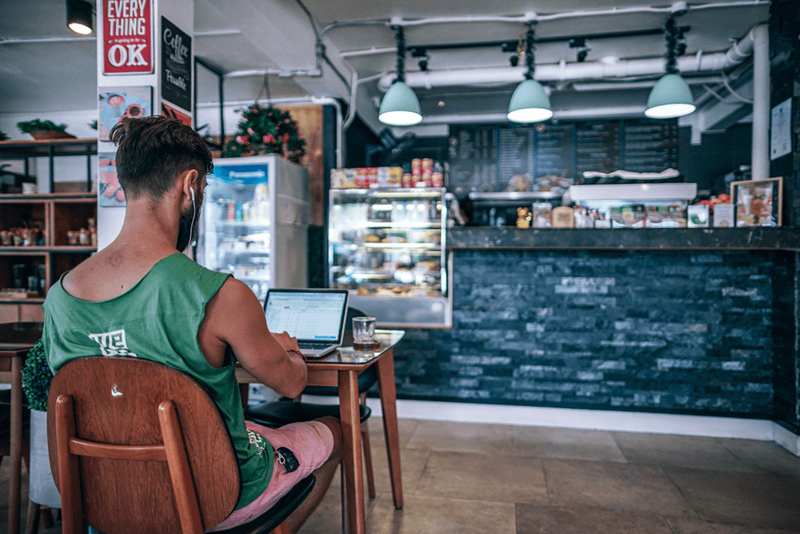 Depending on the nature of the email, you can change the call-to-action and make it suitable for each specific type of email. Click to see what I’ve got to offer. Learn about improving your sales. 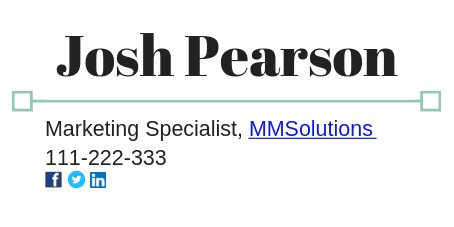 Putting together the perfect email signature is worth the effort. By making your email signature informative, simple and visually appealing but not confusing, you are saying more about yourself than you know. You are showing the client you have an eye for detail, you’re a reliable person and you can be trusted. Therefore, start thinking about ways of improving your old email signature by fashioning a new one. Use the tips listed above and don’t settle for anything less than perfect. Once you nail it, you’ll see the effect it will have on your entire email content.